November 2011 note to readers of HousingStory: This is an old post from March 2009. It predates the blog. I wanted to give this post a home before I take the original down on an old site which is going away. The euphemism “deleveraging” defines this crisis. A person or bank reduces debt by selling an asset. Deleveraging advances. If there is no asset, and no cash on hand, however, debt must still be reduced. A write-off is taken. Deleveraging actually re-leverages the asset seller as bad investments destroy good capital. Thus deleveraging is the opposite of its name in a crash. Many write-offs pushes deleveraging into a bankruptcy. A new euphemism is used: “Nationalization”. The state seizes a bankrupt bank. What do you do with a bankrupt bank? That is the question of the day. A loan officer qualifying a purchaser for a new mortgage reviews the income of the borrower. He then determines an affordable level of debt. “You can go out and buy a property worth X,” the loan officer says. If we are to judge the validity of bank assets like mortgage debt, then Gross Domestic Product (GDP) may be a reliable starting place. GDP is suggestive of a nation’s buying power and comparable to income for an individual. GDP broadly defines reasonable debt levels. Review a history of the ratios of household debt-to-GDP and bank-sector debt-to-GDP. Shrill alarm bells ring out loud. It’s hard to hear anything else. This macroeconomic picture inspires fear. “It cannot possibly be that bad,” one thinks. If 1980 is a base year, and we hypothesize debt levels at that time were affordable and smart, and that we should return to them, then they suggest the excess of debt which households owe today equals $7 trillion (of a total of $14 trillion). That’s terrible and unworkable. It is also modest compared to the financial sector. The excess of financial debt is $14 trillion (of a total of $16 trillion) (see graph 1: “US Private Sector Debt”). Meditating on this excess leverage reminds one of watching from the 2nd floor window of your suburban home as a nuclear bomb detonates in the city center. That is where your office is/was. You are still alive, but for how long? One thing we know: You will not be going to work tomorrow. These gargantuan numbers paint with a very broad brush. All excess debt is not un-payable. Still, while the numbers appear to be impossibly large, they should not be dismissed simply because reason tells us they are impossible. Reason did not guide debt creation. Meditating on this excess leverage reminds one of watching from the 2nd floor window of your suburban home as a nuclear bomb detonates in the city center. That is where your office is/was. You are still alive, but for how long? One thing we know: You will not be going to work tomorrow. Set aside for a moment the argument about what is the right level of debt for all banks and all households. Let’s run a fire drill, and assume in 1980 we had it right. Assume GDP is a valid starting place to determine our ability to pay debt. And then assume $7 trillion of household debt and $14 trillion of financial debt is un-payable. All of it is a write off in this scenario. How do we erase this value-less pestilence? If an individual could sell his house to end a debt burden, he would. If a bank could sell a loan asset to pay down a debt, it would. Unfortunately, if an asset doesn’t cover a bill, they can’t sell unless they admit a loss. The would-be seller waits and hopes and turns to zombie. That’s the difference between a boom and a bust. Selling doesn’t help enough in a bust. My guess is our deleveraging requires a bankruptcy filing, but not for one homeowner or one bank, but systemically, for many or all money center banks, and for a huge subset of households; maybe something like one of five households. If indeed we have to do this, we should get this work done quickly. The question is: What is the smart way to start and immediately finish bankruptcy? These actions radically fortify banks and homeowners. They are valid for all countries with excess debt in households and banks, which includes at least Ireland, Spain, and England. A coordinated enactment among nations may bring stable confidence to the markets. The mortgage plan, which the graph estimates reduces consumer debt by $5 trillion in the United States, accomplishes many things. It’s primary virtue is reawakening a huge number of consumers; the group which accounts for 70% of our economic activity. The impact would dwarf the recent stimulus package, making it a Mini-Me in comparison. With it we destroy negative equity, unfair loans, and foreclosures. Mortgage investments mutate in an instant from bad to good. The owners of mortgage investments, including banks and insurance companies, may be free again to lend, or they are far less un-dead. If you believe time is money, this plan is dirt-cheap medicine. It employs massive simplicity to achieve maximum speed. Should we take such an action, we may even unleash a boom from this terrible crisis. We need the boom to pay off the massive new debts which our government must shoulder as part of this plan. The first step is the most difficult. We must admit a debt which cannot be repaid is not a debt. We must realize our bubble is superior among bubbles. It is different this time – in the breadth of its magnitude. Credit spread the bubble here, there and everywhere. Therefore it is a double or triple or an infinite bubble. Wherever borrowed money could purchase a major asset class, contamination permeates that asset class. And the debt used to purchase it is a mirage. Thus double bubble or bankruptcy squared. You choose the name. Does anyone believe residential real estate and mortgages are the end of our calamity? Who can predict losses in commercial real estate, leveraged buy outs, and credit cards? What performance in those classes should we anticipate if unemployment hits 12% and GDP contracts 9%? Those are the numbers we have to plan for, while at the same time we elide $21 trillion of extraneous debt. Let’s review the economic conditions under which the debtor will struggle to repay the obligations. If we are in a severe banking crisis, history says our unemployment of 4.9% in January 2008 will peak at 12% (it is 7.6% as of January 2009) (3. 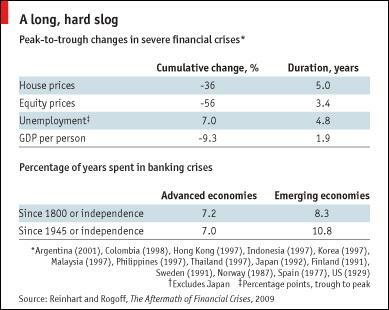 The Aftermath of Financial Crisis). Gross Domestic Product will fall by 9% from its high; a radical drop compared to consensus estimates. Property values will fall 35%. We can only hope it will stop there for us. Stocks will fall 56% — a number easily believed. These terrible things will happen at the same time we must pay the monthly interest expense on a huge possibly excess debt of $21 trillion between households and financial firms. My hypothesis: There’s no way we can make it. Some of the excess debt is a write-off. But how much of it is excess? We actually don’t need to answer that question now. What we need is debt destruction and capital creation. We need bankruptcy. Erase un-payable debts the old fashioned way. Take out the old owners. Install the debt holders as owners. Reorient the economy from debt to equity. Since an un-payable debt is a write-off, and since financial-debt-to-GDP ratios are EIGHT times higher than in 1980, the right question for our banks is not how much their equity is worth. The equity is dead and gone. The right question is: Will bondholders, converted to equity, be destroyed just as their predecessors must be? Given the excess of leverage, they will likely zero out as well. Even if all bank debt for money-center banks is converted to equity, state-sponsored capital injections will likely be enormous. For Fannie and Freddie, there is no such thing as disposable debt holders. Our credit worthiness depends upon us honoring their debts. All their losses go straight to Uncle Sam. They will be mammoth. Generally what we need is to build a bon fire and burn to the ground ten or 20 or 30 years of manic lending. Debt must be welshed on in numerous trillions. Alan Greenspan recently approved of bankruptcy for money-center banks (nationalization), but said bond holders of seized banks require a guarantee (4). The view from the tundra does not support this guarantee. Would Mr. Greenspan support his own position if the banks’ bond holders would be wiped two or three or five times by write offs? Bond investors are adults, and money-center-bank creditors invested poorly. The IMF and Goldman Sachs both predict greater than $2 trillion of loan losses for US-based assets (5). What if the losses are twice that? Our speed-test ratios of debt-to-GDP hypothesize excess debt of $21 trillion for banks and households as one group. What if the $2 trillion figure is short by half? If banks do convert their debt to equity, and the banks end up stronger than they appear, the new equity holders aka the former bond holders will be paid back by the value of their stock. They can get their money back if there is any money to pay them back with. We must dramatically reorient a debt-centered boom into an equity-heavy recovery. Start by paying down all mortgages to a reasonable level. Convert bank debt to equity. The bank debt alone represents almost a trillion dollars of new capital for the four majors and more than doubles the equity account (6). We will have begun reducing a vast part of the grotesque imbalances in broad ratios of debt-to-GDP. 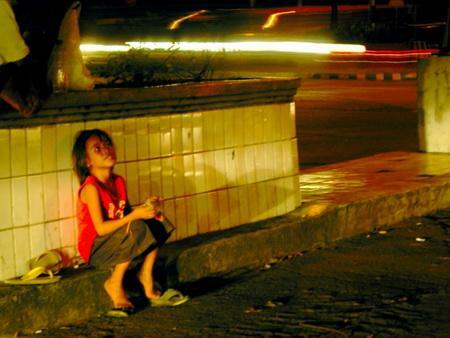 If adequate capital is our goal, why do we ignore this remedy? If new state injections of capital are necessary, and if old injections need to be re-categorized, they should resemble senior debt, which neatly solves the question of government management by giving it to someone else. Since post-orange banks have huge capital accounts and no bad residential mortgages on the books, they have breathing room to make money. Next up are monstrosities in commercial real estate, buyouts, and credit cards. We must anticipate unprecedented write-downs in these categories. And we must devise the same instant-bankruptcy mechanisms for these assets as is suggested here for mortgages. Regulators must expand their thinking. They must move beyond their scientist-like role as lender-of-last-resort. They have handled this well, but science is easy. Now they have to do the art work. This will require that they wear different hats which are at first uncomfortable. They are the bankruptcy prosecutor-judge-and-jury of-last-resort and parent-with-checkbook-open of-last-resort. While they adapt to those roles, we put the lending rules back together again. Make the rules real and make them stick. Regulate leverage for banks as borrowers. Regulate leverage for banks as lenders. It’s a great cure all for our ugly failures. We don’t have time to play around. Review the devastating early effects of our crisis. Global equity markets had fallen $21 trillion last year at the market low (7). Fifty million people worldwide are now expected to lose their job (8). How many mouths are now unfed, when even before the disaster 100,000 people starved to death every day (9)? When these innocent bystanders enter our calculus the dictates of moral hazard grow false quickly, and the regulation of leverage now can bar repetition of our most serious errors. Until the next time. Untold masses and markets all over the world depend upon us. We can’t be guided by the hurt feelings of stock and bond holders. We need a bright rebound. We need radical courage, great ambition, and intelligence. Plan Orange has it. A zombie is a person, bank, or country which pretends a vast array of un-payable debt has substance. We are not a zombie country. We need to get to work, and a radical move into equity will make this possible. We have nothing to fear but debt itself. Just take aim at this ugly beast debt. Kill it dead with bankruptcy. Write off the debt and burn it to the ground. Good things follow. 1. GDP-to-Debt in major sectors. 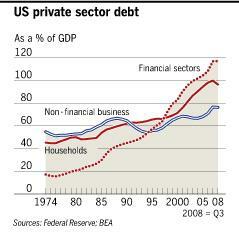 See graph labeled “US Private Sector Debt”. 3. Bank crisis statistics. See “The Aftermath of Financial Crisis”. Dec 19, 2008. Carmen Reinhart & Kenneth Rogoff. 4. Greenspan on bank bondholders: ”You would have to be very careful about imposing any loss on senior creditors of any bank taken under government control because it could impact the senior debt of all other banks,” he said. “This is a credit crisis and it is essential to preserve an anchor for the financing of the system. That anchor is the senior debt.” Financial Times. 2/18/09. “Greenspan Backs Bank Nationalization”. 5. Credit-loss projections. IMF & Goldman Sachs. “The fund said that credit losses from bad assets originating in the US would be $2,200bn (€1,662bn, £1,537bn), a sharp increase from its previous $1,400bn estimate.” Financial Times, 1/28/09, “IMF Slashes 2009 Growth Forecasts”. “Analysts at Goldman Sachs were the latest to jack up estimates of potential U.S. loan losses. In a report released late Tuesday night, Goldman economists estimated that losses from delinquent U.S. residential mortgages alone would hit $1.1 trillion as home prices sink, up from an earlier estimate of $780 billion. Add in losses from commercial real estate, credit cards, auto debt and business debt and Goldman’s loan loss estimate hit $2.1 trillion.” Wall Street Journal 1/15/09 “Banks Loan Losses Could Reach $2 Trillion. 6. 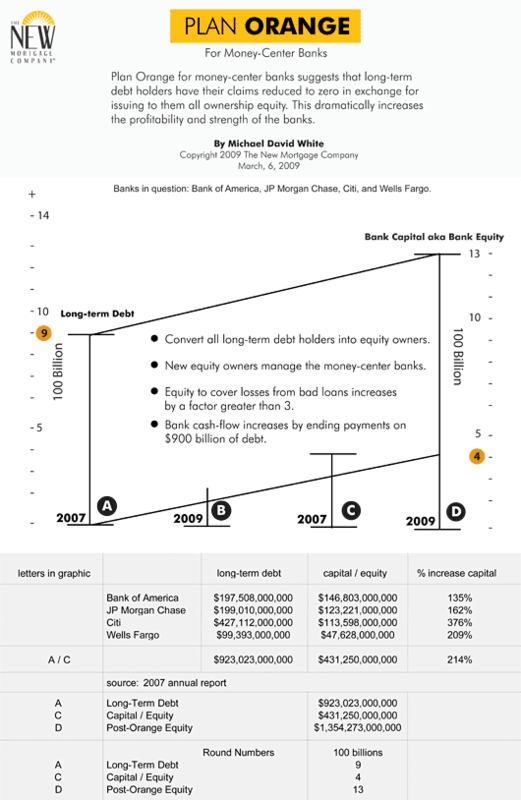 Long-term debt and equity at money center banks (2007 annual report of BA, Chase, Citi, Wells). 7. $21 trillion lost in equities: “When equities bottomed on 21 November 2008, the MSCI World index had fallen 55 per cent since 31 October 2007. This worked out at a global loss of $21 trillion, or $ 21,000 for every individual in the developed world.” TimesOnline. 2/11/09. “Global Stock Market Losses Total $21 Trillion”. 8. 50 million jobs lost: “Worldwide job losses from the recession that started in the United States in December 2007 could hit a staggering 50 million by the end of 2009, according to the International Labor Organization, a United Nations agency. The slowdown has already claimed 3.6 million American jobs.” New York Times. 2/15/09. “Job Losses Pose a Threat to Stability Nationwide”. 9. 100,000 die of starvation every day: “In 2006, more than 36 million died of hunger or diseases due to deficiencies in micronutrients”. Wikipedia: Entry under Malnutrition. World Health Organization.